The submarine shooter is about to receive a reboot. Ah, the sea. It welcomes you into its salty bosom, the waves rocking you gently as the words of Jacques Cousteau echo in your head. Words of beauty and peace. Those words vanish as leaky, oil-spewing submarines duke it out below the surface with explosive weaponry. AquaNox might not have been the most faithful submarine simulator, but it made sense back in the early 2000's. While perhaps not the most well-remembered of titles, Nordic Games thinks there's a place for the property in the modern world and is currently fashioning a reboot. The idea behind AquaNox definitely has merit. The futuristic underwater world certainly has more charisma than a generic space setting. 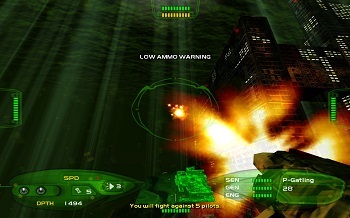 Each mission was punctuated by optional dialogs and ship outfitting, giving it less of a linear feel then most shooters. The tech behind it was so advanced for its time that it was used as a benchmark test, like an early Crysis. While the onward march of gaming progress has not been kind to particular elements of the game, the idea seems seaworthy enough on its face. While other "six-degree-of-freedom" games like Descent still maintain a cult following, AquaNox seems to have quietly sank to the depths. Perhaps news of its rebirth will stir the loyal to arms again. While Nordic Games acquired AquaNox from JoWood, it also recently snapped up armfuls of obscure or dormant properties from the collapse of THQ. Along with AquaNox, they also acquired Summoner, Titan Quest, Destroy All Humans, and Frontlines, among other.